And then Christian made a heart shaped bacon and I was reminded, once again, that I am in fact the luckiest girl in the world. So, there's this thing called baby weight and baby weight and I are not BFFs. Baby weight wants to hang out, like all the time, and I'm like "Enough! You are so 2012." 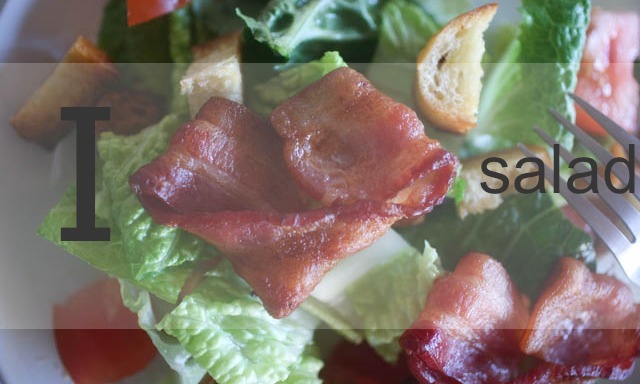 So yeah, I've been eating a lot of salad, with bacon - I know, I'm totally hopeless. Before we move on to this recipe I must add a few disclaimers. a) Weight does not a person make. b) I think talking about bodies in a positive way is really important. If you don't believe me let me just say that I love talking about bodies in a positive way more than I love bacon, in fact I think bacon and body positive chats go hand in hand. Amy Hackworth shared some great links to some great articles about all of this on her post on Design Mom. c) I'm not just eating salad. Thought I should make that clear. Let me tell you how I made this. Because this is delicious and I think it's a pretty snazzy salad to serve on Valentines Day. Preheat oven to 375*. 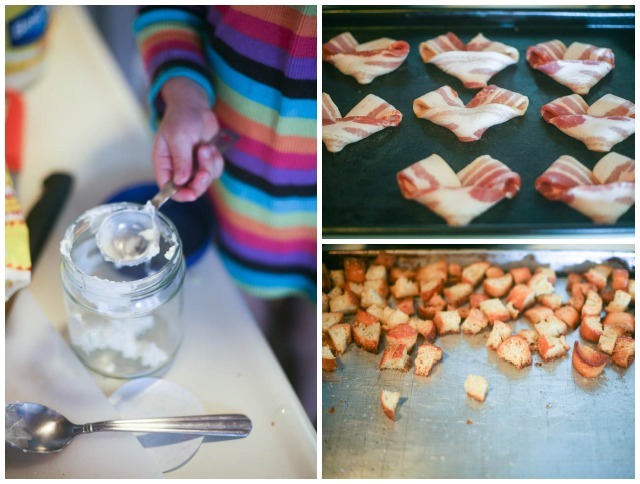 Arrange bacon on a cookie sheet and shape it like a heart. Bake until crisp (15-20 min). Set aside. Toss the bread with olive oil and season with salt and pepper. Spread on a baking sheet and bake until golden brown (15-20 min). Set aside. In a glass jar mix together the heavy cream, mayonnaise, vinegar, and green onions, Season with salt and pepper. I like making it in a glass jar, that way if I don't use all of the dressing I can easily save it for later. 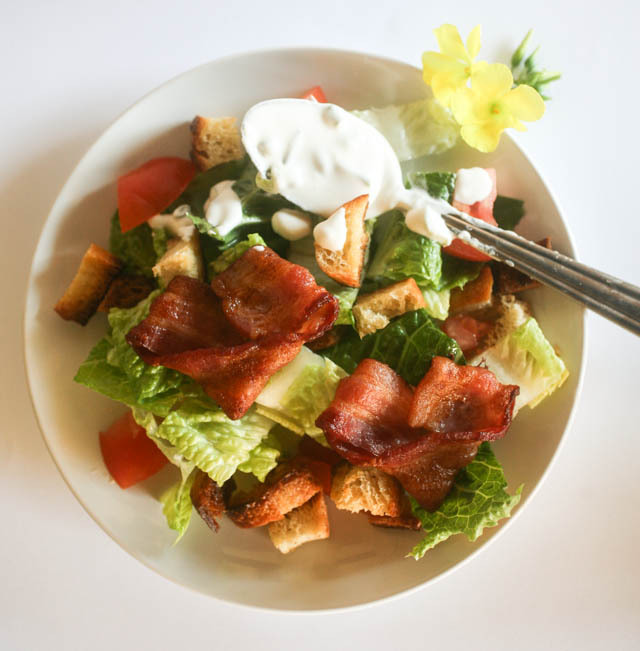 In a large bowl toss together the lettuce, tomatoes, and croutons. Serve in individual plates. Add two heart shaped bacon slices to each plate. Coat with dressing. PS- If you're looking for more salad recipes last year I did 31 days of salad with the help of some of my favorite bloggers. You can also find all of the recipes from that event on this Pinterest board.